Offers authentic charm and character, just a short walk to Burgau villsge and beach. Qta. das Estrelas is spacious, light and airy, combining modern convenience with tradition. All rooms are tastefully furnished with country views. Character features include large entrance hall, traditional Portuguese tiles, terracotta floors and high wooden beamed ceilings. The thick stone walls keep the property warm in winter and cool in summer. For additional comfort fans are provided for summer cool and electric heaters for winter warmth. Lounge and fully equipped kitchen also have working wood burners. The farmhouse is approached by a private drive. The house is located in the center of the land with no immediate neighbors. 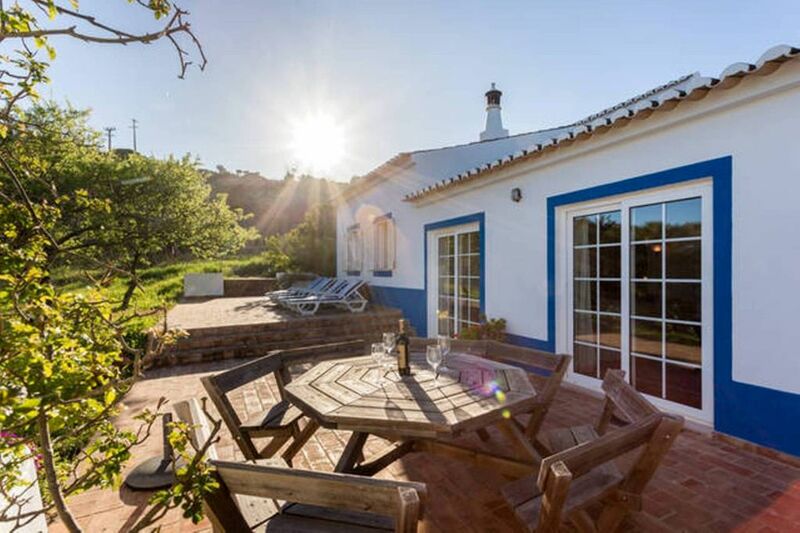 The South facing terrace has traditional Santa Catarina tiles and views over horse paddocks and countryside toward Burgau village. BBQ. loungers, table, chairs and sun umbrella are provided for outdoor eating and relaxation. There is a separate lawned area with 4.6m circular plunge pool (depth 1.2m with ladder style steps) and feature bread oven. To the rear of the house are stables, ample parking, paddocks (with resident pony & cats) All rooms enjoy country views. Maid servisse supplied for each 7 nights booked to clean and change the linen. Household linen is provided. Hello my name is Susan. I was born and raised in England where I studied Fine Art and worked for many years in Art colleges while also enjoying training and racing Arabian horses and painting. I always had a desire to live in warmer climes and now live permanently here in the Algarve with my Brazilian born husband Peter. I am a qualified Hatha Yoga teacher and also work at a local ecological golf and resort project with an organic vineyard. In my leisure time I enjoy the beaches, horse riding, yoga and painting, We look forward to welcoming you to this very special part of the World. This property is located in a nature reserve and enjoys peace, privacy and country views whilst also being close to the sea and village amenities. Burgau is a very pretty fishing village with a sheltered family friendly blue flag beach. The nearby delightful historic town of Lagos with its old centre is perfect for shopping, nightlife or to catch up on some culture. The farmhouse offers a superb location for exploring the local area. From this location you can have almost any kind of holiday you could wish for, from picturesque fishing villages with friendly local restaurants to world class golf courses. Swim on sheltered, gently shelving family friendly beaches at Burgau, Cabanas & Luz. or Surf the West Coast rollers. Enjoy walking, bird watching or horse riding aong the coastline and in the natural park. From Lagos enjoy boat trips to view the grottos or dolphins. Or just stay and relax at the Quinta and watch the sun go down from the terrace while the barbeque sizzles and enjoy the nature around you. We have tried to equip the villa with everything to make your stay enjoyable, including personal touches such as beach equipment, games, toys, books, and music. toilet, combination tub/shower, bidet, Full size bath and electric heater for winter. Fireplace/Logburner in the lounge. Winter logs provided. Bathroom towels provided. Beach towels can be hired to save on packing space. Log burning wood stove in kitchen. 5.6 x 4m. Large character lounge with log burner and country views. 2 comfortable sofas, coffee table and sideboard. T.V. DVD and CD player, English books and games for your entertainment. Two pairs of patio doors opening on to sun terrace. 5m x 5.6m Very large well equipped country kitchen/dining/family room with tables, chairs and sofa. Cooker with gas hob and electric oven and grill, dishwasher, fridge, toaster, coffee machine, kitchen utensils. Woodburning stove. Door leading to terrace. Large dining table and chairs in the spacious kitchen. Table for outsider dining and seating on the South facing terrace. Assortment of adult and childrens books. 5 acres of private land with stables, horse paddocks and countryside. Hammock for outdoor relaxing. Availble to hire in Lagos. Boat trips available from Lagos marina including grotto trips, fishing trips and dolphin spotting. Large South facing terrace with views over countryside towards Burgau village. Terrace is not overlooked and equipped with table and chairs for dining and sun loungers. At nearby Burgau Sports Centre just a 5 minute walk from the farmhouse. 4 courses within easy access by car. Approx 10 minutes: Espiche Golf, Boa Vista & Parque da Floresta. 15 mins Palmares, 20 mins: Penina. just had a fabulous 17 days here, the most chilled, laid back and relaxed holiday ever! the property is about 1km out of town, a nice walk in to build up a thirst/appetite. the kitchen is fully equipped to cater "at home" if that is your preference though. Sue, though she visits the property every day, is never intrusive, and most days you dont realise she was there. if you do ever need her though, a phone call and she will be there within a few minutes to help or advise as necessary. the property is completely private, but with good all round views. set back a little from the road, you have views of both countryside and of the town. we were attacked relentlessly by mosquitoes for the first week or so, but that is not Sues fault, we just have delicious blood! i would not hesitate to recommend this property, and would definitely go back again, if only for the pool, and the privacy it offers, even form the rest of the property! Thank you for your visit Michael and for taking the time to write your review. It was a pleasure to meet and host for you. I am very glad to hear that you enjoyed your visit and had some much needed relaxation. I hope the mosquitos did not spoil your stay. There are anti mosquitos plug ins in the villa and a spray skin repellent which is necessary outside if you are attractive to mosquitos. Some people seem to have very sweet blood. Luckily there are no vampires in the area! We would be very happy to welcome you back to Quinta das Estrelas in the future and wish you a very pleasant summer. wonderful property quiet and secluded ,just what you need to unwind. the owner Susan was there to welcome us and was helpful and pleasant. although secluded walking to the beach is a pleasant 10 to 15 minute walk. we would go back again purely for the ambience of the place. you would have to be very picky not to like this place. Thank you for your review Bill. It was a pleasure to meet and host for you. I am very happy that you enjoyed the farmhouse and hope to welcome you back in the future. We thoroughly enjoyed our stay at Susan's farmhouse.Treacle was lovely and we enjoyed feeding him carrots.It was very peaceful and private.The views were lovely.We would recommend it to anyone.We really liked the patio area which was a real suntrap.Hopefully we will visit again. Keith and Brenda. Thank you for your review Brenda. It was a pleasure to meet and host for you and Keith. I am very happy that you enjoyed your visit and hope to welcome you back in the future. Wow! From the moment we drove up until the end, it was a truly relaxing holiday. Little bit closer to the road than we thought, but fantastic. Truly recommend it. Plunge pool was useful to cool off in an afternoon. Would definitely go back. Thank you so much for taking the time to write a review of your stay at Quinta das Estrelas. I am so happy that you enjoyed your visit and hope that we can welcome you back in the future. Easy 10 minute walk (1km) to the sheltered blue flag beach with beach bar/restaurant at Burgau. The sandy beach is set in a pretty sheltered bay flanked by spectacular cliffs. The Algarve is famous for its beautiful sunsoaked beaches and many more are easily accessible by car all along the coastline. The rugged and wild west beaches of the west coast are a surfers paradise located in a protected natural reserve, whilst the Southern beaches are more sheltered and family friendly. Faro airport is approx 1 hours drive on the new motorway, Seville 2.5 hours and Lisbon 2.5 hours. Car hire is recommended but not essential. A local bus service is available from Burgau village and various trips can be arranged with pick ups in Burgau. Taxi from Faro airport approximately 80 Euros. Train from Faro to Lagos. Take a taxi from the airport to the train station and call us when you are on board. We can pick up from Lagos station. Burgau is the next village west from Praia da Luz. The pretty and historic town of Lagos with its marina and walled town is about 10 minutes drive east. Sagres and the stunning west coast are a 25 minute drive west. The beautiful old Moorish capital of Silves and its castle approx 45 min drive away. Monchique town, mountains and Spa also 45 mins. Water Parks/Zoomarine approx 40 minutes (also available by pick up service). Burgau village is a small and picturesque fishing resort. Narrow cobbled streets tumble down to the lovely sandy beach backed by cliffs. The slipway is lined with colourful fishing boats. Winding side alleys weave up to the clifftops with spectacular views. The village has an excellent choice of restaurants, cafes, bars, mini mercados and gift shops to choose from. There is also a multibank machine, newsagents, butchers, mobile post office and fishmonger. There is a surf school in the village. Burgau Sports Centre has a swimming pool, sports facilities and children's activities. At the next village of Praia da Luz, a 5 min drive from Burgau. There is a bank, 24hr multi lingual medical centre, dentist, optician and hairdressers, plus plenty more bars cafes and restaurants. Other activities available locally include 4 golf courses, horse-riding, surfing, water sports, scuba-diving, archery, deep-sea fishing, boat trips, jeep safaris, tennis, gymns, and spectacular walks on inland and coastal paths. The historic and scenic town of Lagos and its marina are just 15 mins away by car. With its buzzing atmosphere, Lagos hosts a variety of bars, restaurants, shops, cafes and street entertainers making its friendly atmosphere a delight by day or night. Lagos shops are open till late in the summer months. Imagine cobbled streets, white washed houses and quaint fishing villages combined with dramatic coastlines, blue skys, many hours of sunshine, a relaxed lifestyle, excellent cuisine, and welcome to the Algarve.